Crispy on the outside and creamy on the inside. 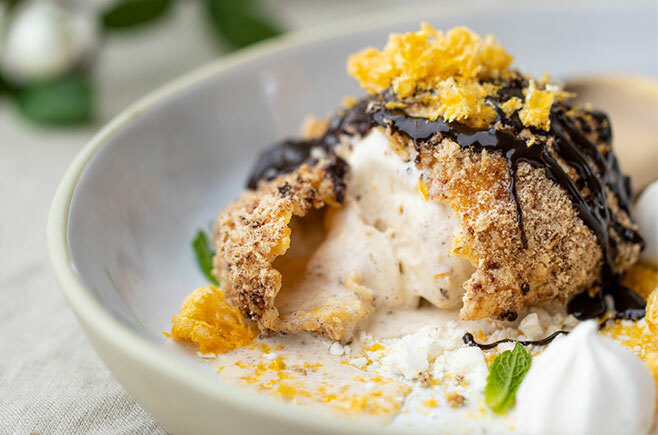 There’s a lot to love about fried ice cream and now, thanks to our friends at Fantastic Snacks you don’t have to miss out just because you’re following a gluten-free diet. Heat the oil in a deep fryer or a large saucepan to 190°C. Fry the balls one or two at a time, don’t overcrowd the fryer, until golden, approx. 2-3 minutes. SERVING SUGGESTION: Crumble some gluten-free meringue onto the base of the serving dish and decorate with some extra meringues and either dried or fresh orange segments. Thanks to our friends at Fantastic Snacks for sharing this recipe for Gluten-Free Fried Ice Cream. Visit their website for more recipe ideas.